One of the reasons we produced this film is to help families going through job loss, downsizing, foreclosure, and more. We know it can be a very difficult time for the family. Coming soon, this page will have more resources available for you to help with your marriage and family issues, as well, help you get back on your feet financially. Although it is a difficult time, there is a way to make it to the other side with your family intact; these resources will help you to do that and we look forward to sharing them with you. Michael is the writer, producer, director, and one of the actors in "Foreclosed." If you decide to purchase a copy of the DVD and show our film to your church or group, Michael can also be booked to talk about any number of topics that relate to the films topic. He can also include fun behind the scenes tidbits from their days filming. For more details about booking Michael feel free to either email info@silverdovefilms.com or call our production company at 866-285-8852. A great way to use the film is to show it to your group and then afterwards have a discussion about the films topic. First, be sure to purchase a DVD and then download the discussion guide on the right and use it as a resource to help you create a bible study and discussion. Discover how you can overcome hardships, experience miracles, and enjoy a life of contagious faith and joy. Yes, it is possible to live a life that is totally dependent on Christ for everything. 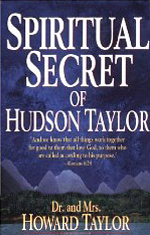 Missionary Hudson Taylor experienced many miraculous answers to prayer and in his book he shares these exciting testimonies of God's gracious provision. You can purchase this on Amazon HERE. Take this 31 day journey through the Book of Ecclesiastes with Dr. Jeremiah and discover what it means to be content and have true happiness on earth.